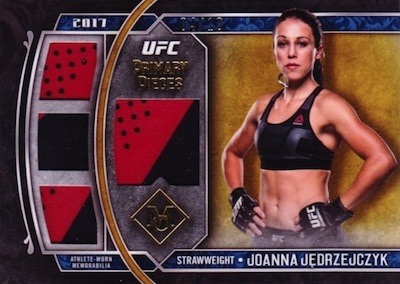 Back for another year, 2017 Topps UFC Museum Collection sticks with the hit-based, one-pack format. 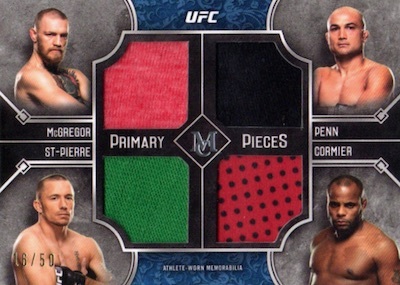 Each MMA box includes two autographs and one relic. While the premium UFC brand started as an insert, it has since moved to a standalone product that first debuted in 2016. 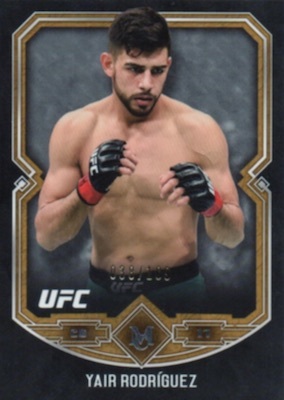 Changing to a black-based color scheme, the 2017 Topps UFC Museum Collection checklist incorporates 50 fighters into the base set. Parallels bring subtle color additions and rarity with numbered Copper, Gold (#/75), Sapphire (#/50), Ruby (#/25) and Emerald (1/1). 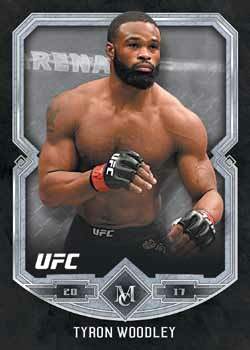 With two signatures per box, including one autographed relic, the signed inserts are a UFC collecting favorite. Museum Autographs is a new set with on-card autographs and a print run of 99 or lower. These add Copper (#/25 or less), Gold (#/10 or less) and Emerald (1/1) parallels. 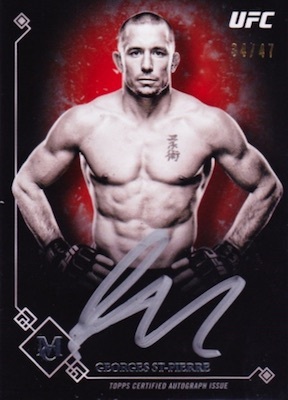 Doubling up the fighters are the hard-signed Museum Dual Autograph cards, numbed to no more than 10 copies. And we can’t forget the very popular Museum Collection Framed Autographs, also with on-card signatures, that are a case hit. Versions include Gold Frame (#/15), Silver Frame (#/5) and the one-of-one Black Frame. Providing an athlete-worn relic piece to go along with the autograph, the Signature Swatches insert line features Single, Dual and Triple Relic versions, all of which are numbered. They also each have Gold (#/25) and Emerald Patch (1/1) parallels. 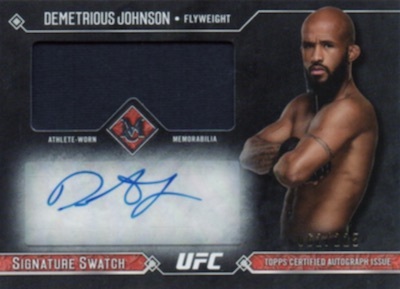 The new Signature Swatch Reebok Logo Autograph (1/1) cards contain a jumbo brand logo from a UFC Fight Kit jersey. 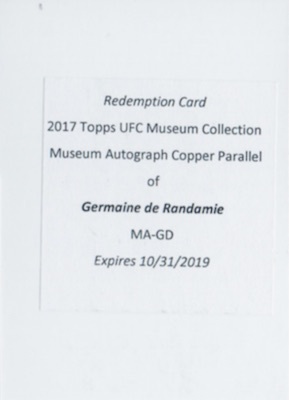 Falling one per 2017 Topps UFC Museum Collection box, relics provide another quality choice. 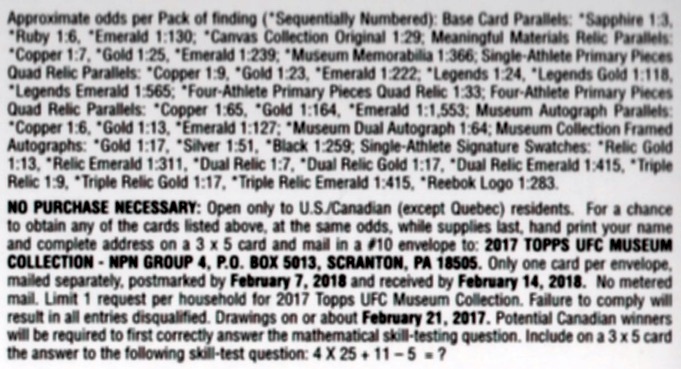 Containing athlete-worn or event-used memorabilia swatches, the Primary Pieces quad relic set includes Single Athlete (#/50 or less), Single Athlete Legends (#/25 or less) and Four Athlete (#/50 or less) insert sets. There is also the prime Meaningful Material Relics insert. Parallels for the memorabilia options include Copper (#/35 or #/25), Gold (#/10) and Emerald Patch (1/1). Finally, we come to the premium Museum Memorabilia cards with an oversized relic on a one-of-one offering. 2017 TOPPS UFC MUSEUM COLLECTION MAX HOLLOWAY SWATCH AUTO #’d 40 299 CHAMP! 2017 Topps Ufc Museum Collection Tony Ferguson Triple Patch Relic Auto #3 25! 2017 Topps UFC Museum Francis Ngannou (LOW#) (1ST AUTO) REDEMPTION CARD!!! 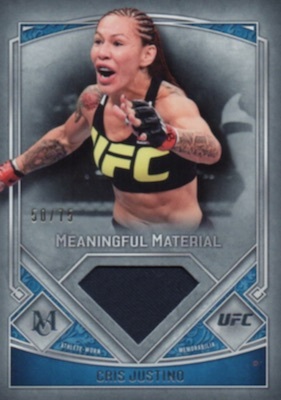 Shop 2017 Topps UFC Museum Collection cards on eBay. PARALLEL CARDS: Copper #/109, Gold #/75, Sapphire #/50, Ruby #/25, Emerald 1/1. 55 cards. Serial numbered #/99 or less. PARALLEL CARDS: Copper #/25 or less, Gold #/10 or less, Emerald 1/1. VERSIONS: Gold Frame #/15, Silver Frame #/5, Black Frame 1/1. 27 cards. Serial numbered #/75 or less. PARALLEL CARDS: Copper #/35, Gold #/10, Emerald 1/1. 29 cards. Serial numbered #/50 or less. PARALLEL CARDS: Copper #/25, Gold #/10, Emerald 1/1. 11 cards. Serial numbered #/25 or less. PARALLEL CARDS: Gold #/5, Emerald 1/1. 4 cards. Serial numbered #/50 or less. 15 cards. Serial numbered #/399 or less. PARALLEL CARDS: Gold #/25, Emerald 1/1. 13 cards. Serial numbered #/99 or less. 12 cards. Serial numbered #/99 or less. 19 cards. Serial numbered 1/1. 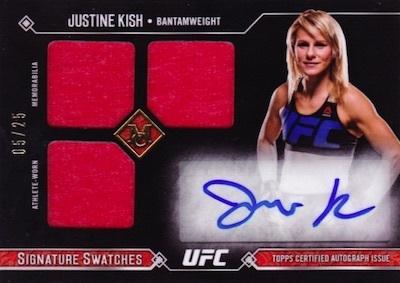 Good: On-card autographs really pop; framed cards continue to lead the way; solid influx of young talent. Bad: Many redemptions; very few big-name hits; more sticker autographs for the relic sets. The Bottom Line: Moving to a black-based design has its pros and cons, but the overall effect is eye-catching, especially for the hard-signed cards. However, without any true superstar hits to chase, the upside is capped considerably, and that may push collectors to buy singles rather than boxes. 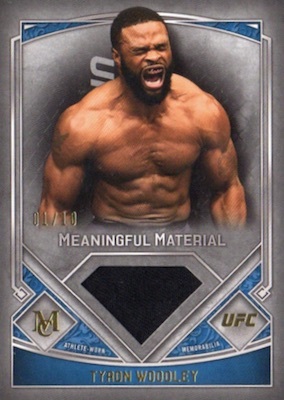 Taking the 2017 MLB design, 2017 Topps UFC Museum Collection uses a lot of black in the scheme, which can make the damage very easy to identify. Chipping was an issue on several cards right out of the review box. Obviously, a dark design requires a different type of signature to stand out. The answer here is a thick, silver pen. These are a double-edged sword as they do really jump out but can be kind of a mess, also. For some, the signature is too thick and much tougher to decipher. Others appear as the though the pen was running low. But, when it works, the result can be quite impressive. Regardless, this on-card look makes the sticker signature relics seem even more out of place. It would be nice if Topps could figure out a way to change to hard-signed relic cards, especially in a hit-based product like this. It also seems like overkill that most subjects have three different Signature Swatch versions (single, dual and triple) that change very little. As it was the one relic hit in the review box, the Meaningful Material card was a little underwhelming with the diamond die-cut cutout being the only unique aspect. 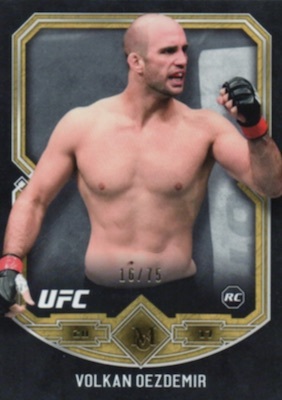 Transitioning to some of the newer stars of MMA, many with their first autographs, the main problem with the 2017 Topps UFC Museum Collection checklist is the lack of top-level subjects to buoy the home run potential. Other than Chuck Liddell, there is not much to hope for amongst the retired/former champion lineup. Despite being a premium product, there really aren't many big-time hits other than the one-of-ones. Another issue is the redemptions. There are quite a few to be found in the set (including our review box). This is extra disappointing because the product was delayed from an initial release in November, and eventually moved to the end of February. One would hope the extra months would have cut down on this a bit more. On the positive side, all hits in the box were numbered, as well as two of the base cards. So, five of the eight cards had a finite print run. And it's nice that the redemption in our box is for a low-numbered, on-card autograph. When you leave off the bigger names, it can make it more difficult to have good value potential. Boxes sit around $70 at the time of this review, which is not terrible for two autographs and one relic. However, since the main Signature Swatch insert has print runs as high as 399 when most other hits are numbered to 99 or less, more pressure falls on the other autograph, which is likely to be hard-signed. The good thing is that it only takes one card to make the box worthwhile at this price point. While the chance for something incredible is not likely, seeing a fair return on the box value is possible. Still, this is a set that is much more appealing via singles than boxes. Personally, I liked 2016 better. 2017 was not as enjoyable in my eyes and this was mainly due to the designs and the outcome of the box. That is always the risk with these one-pack releases as there is not much of a chance to make an impression. The box used for this review was provided by Topps. 2017 Topps Ufc Museum Katlyn Chookagian 1st Autograph Gold #2 10 Rare!!! 2017 Topps UFC Museum Daniel Cormier Autograph 10 25 2 Weight class CHAMPION!! Loved 2016, but no Conor, Ronda or Jon Jones autos. Paid almost 1k for case hoping to get a 100-300 dollar card is the best case scenario.